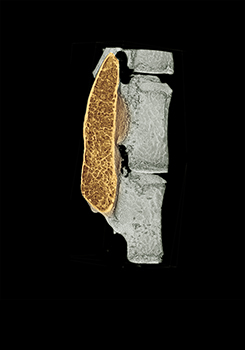 The colored region in a micro-CT image shows regenerated high-quality bone in the spine with minimal use of growth factor. No image credit. There hasn’t been a gold standard for how orthopaedic spine surgeons promote new bone growth in patients, but now Northwestern University scientists have designed a bioactive nanomaterial that is so good at stimulating bone regeneration it could become the method surgeons prefer. While studied in an animal model of spinal fusion, the method for promoting new bone growth could translate readily to humans, the researchers say, where an aging but active population in the U.S. is increasingly receiving this surgery to treat pain due to disc degeneration, trauma and other back problems. Many other procedures could benefit from the nanomaterial, ranging from repair of bone trauma to treatment of bone cancer to bone growth for dental implants. Stupp is director of Northwestern’s Simpson Querrey Institute for BioNanotechnology and the Board of Trustees Professor of Materials Science and Engineering, Chemistry, Medicine and Biomedical Engineering. For the interdisciplinary study, Stupp collaborated with Dr. Wellington K. Hsu, associate professor of orthopaedic surgery, and Erin L. K. Hsu, research assistant professor of orthopaedic surgery, both at Northwestern University Feinberg School of Medicine. The husband-and-wife team is working to improve clinically employed methods of bone regeneration. Sugar molecules on the surface of the nanomaterial provide its regenerative power. The researchers studied in vivo the effect of the “sugar-coated” nanomaterial on the activity of a clinically used growth factor, called bone morphogenetic protein 2 (BMP-2). They found the amount of protein needed for a successful spinal fusion was reduced to an unprecedented level: 100 times less of BMP-2 was needed. This is very good news, because the growth factor is known to cause dangerous side effects when used in the amounts required to regenerate high-quality bone, and it is expensive as well. The findings were published today (June 19) in the journal Nature Nanotechnology.